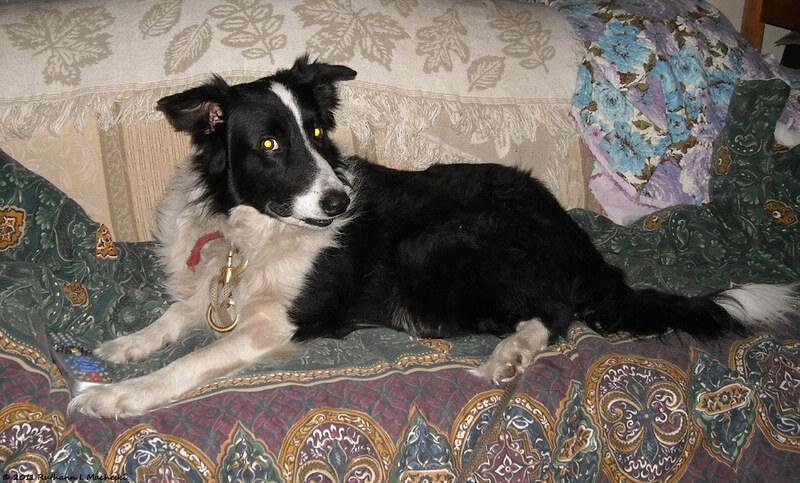 Herself Gets A Scare - Ramblings of Mad Shutterbug & the Border Collie Bros. Being an off to work at Hospital day, I left teh Ranch dark and early, driving through fog as expected. Later, when Herself headed out to do morning rounds she took the Bros with her as usual. Getting back to the House, she started feeding the Dirty Yard Birds (chickens), then put Houdini on his line (he asked to stay outdoors) and turned around to put Squrrl back on his line. Right. Someone wants to be Indoor Dog #2. My dad and I spent 30 minutes one time scouring the neighborhood for Riley. He was on my bed. And did you notice the remote control for the TV? he should totally get Indoor Dog privileges. I Concur. If I can do three big dogs in a teeny house, one more little border collie should fit right in at the ranch! This requires Squrrl learn that lifting ones leg to mark territory inside the House is not acceptable behaviour. Upon Which we are working. We almost lost Minnow a few days ago, so I empathize with the heart stoppage! I'm glad he turned out to be safe and sound. We're thinking that when we have a house, we might get a border collie. Except, he disappeared into the House. Of course. And yes, they all understand WORK TO DO, NAO, KTHX. On the occasions when I get back from Hospital late and may stop to feed all livestock on the way in, rather than getting the Bros (thus, yanno, a Night Off for them) Squrrl is quite disappointed. What? NO WURX? ONOES! Squrrl....you really shouldnt do things like that! But get the lifting leg thing and you can be indoor dog too! But, but, I've got to let Houdini know which parts of Indoors are his, and which parts are Mine!